If you have further questions, please don’t hesitate to ask. Where and when is the Market? The Sunday Farmers' Market seeks to connect local farmers to customers in the Lincoln area. We also work to be visible in the local food movement and support the growth of local food production and sales.  The Sunday Farmers' Market is on Sundays from 10am-2pm late-April through October. We operate rain or shine in the parking lot of the College View Seventh-Day Adventist Church at Union College. You will find us on 48th Street between Prescott and Lowell. We’re always on the lookout for individuals like you wanting to get involved. Visit our Get Involved section to find out ways to donate or volunteer. Donations to the Sunday Farmers' Market are used to promote local food production and consumption. Donations help offset the cost of market management and operations in order to lower the barriers of participation by local farms, and also augment our SNAP match program that makes local food more available to low-income customers. Sunday Farmers' Market warmly welcomes dogs. However, being a dog-friendly market requires friendly dogs! Please help us stay that way by following these guidelines for bringing your pet to Market. Consider visiting Market after 12pm when the crowds are lighter, especially if you have a larger dog. Dogs need to be on a short, non-expandable leash, and under your control at all times. Keep dogs and their noses away from food, plants, and tables. Cleanup all accidents. Please come prepared for this, but stop by the Information Booth for cleaning supplies if you didn’t. We’re happier to provide those than clean up after your dog. Dogs need to be sociable and well trained before they come to Market. But not too sociable. Even friendly barking alarms some people (especially the Market Manager) and other dogs. If your pup tends to bark, the market isn’t a good place for him. Be considerate — not everyone loves dogs and some customers are allergic to animals. Dogs or dog owners who misbehave will be asked to leave the market. Thanks for helping to keep Market dog-friendly!